You are currently browsing the tag archive for the ‘Hostess Gifts’ tag. The Passing Down of Heirlooms: Cookbooks. Cookbooks are such a wonderful heirloom gift, and one I received this past holiday! On one hand, a great way to be able to pass on the tradition of cooking to others. And on the other hand, a wonderful gift that will be used, kept and passed down through the generations. A special handwritten note on the inside cover is an extra special treat to be cherished down the road. I received the oh-so-fantastic Martha Stewart Cooking School book from Mom. 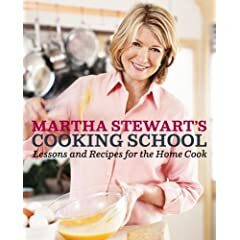 Unlike most cookbooks that are simply filled with recipes, Martha’s book is filled with lessons & photos on HOW to cook – more techniques and lessons. You’ll find such things as how to clarify butter, the difference between chopping, mincing, dicing & slicing and more. Love it. Get it. And of course, thought I would share my favorite “heirloom” cookbook that we used during the holidays to make Christmas cookies. Betty Crocker’s Cooky Book is just a wonderful treat – with fabulous recipes and charming little illustrations. A favorite in our family!